from date of shipment of product. 1.2 Outside of Warranty Period: Product elapse the 2-year warranty period. 1.3 Extended Warranty: Warranty extended per request of customer at extra service charge. Related requirements shall be handled as per Extended Warranty Service Policy. All Non-Acrosser products will be covered by Acrosser for one year. After one year, Acrosser does not take responsibility and owners should contact Third Party Manufacturers for warranty service and provide model numbers and serial numbers of the Third Party item. All Non-Acrosser products supplied within assembled systems by Acrosser will be covered by the Acrosser's one year warranty and shall not exceed one year of coverage through Acrosser. Third Party items include, but are not limited to, CPUs, RAM, Hard Drives, Floppy Drives, CD-ROMs, Ethernet Cards, Non-Acrosser Video cards, etc. During the warranty time period, Acrosser reserves the right to repair, replace, or upgrade the 3rd party non-Acrosser products and / or items with either new or remanufactured condition based on availability. used under normal condition and occurred with problem within the warranty period. 3.2 No Serial Number on the product or the Serial Number is unable to identify. 3.3 Resale Product Warranty Label is destroyed and is unable to identify or removed. 3.4.2 Force Majeure event – such as will of god, flood, fire, thunder strike, typhoon, earthquake, war or worm infection. Each RMA case will be photographed on arrival for documentation. Acrosser's warranty service will not cover product damages arise from negligence of shipping. Definition of TAT: Date of Acrosser Receipt and Date of Acrosser Shipping. 4.1.4 Non-Acrosser product will be sent back to the original maker for service / maintenance and the time for maintenance / service will be 3 working days for processing added to the return time of original maker. 4.2.5 Customer delayed reply or failed to reply the information required by Acrosser, such as environment of application, system configuration, etc. 5.1 Acrosser will take full responsibilities of DOA service. 5.7 If same problem occurred to the product completed maintenance / service by Acrosser within 3 months, Acrosser will provide completely free maintenance service and will be completed as soon as possible. 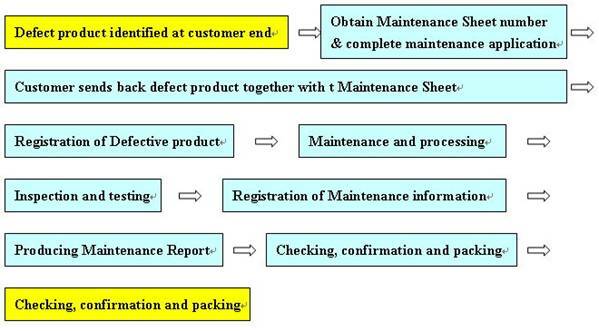 However, this is not applicable to situations like improper use of customer, unauthorized disassembly or modification, poor operating environment, improper maintenance, and accident of other cause leading to the repetition of same problem. 6.2.2 No accessories shall be included when sending back the defective product, unless such accessories is related to the problem of product, and please listed the accessories accompanied in the Maintenance Sheet. Acrosser shall not be held responsible for any item not specified. 6.2.3 Please use the original packing material or appropriate packing material when sending back the defective product to avoid additional damage in transit. Customer shall be responsible for any damage out of improper packing. time) at the discretion of Acrosser. done by 3rd-Parties out of Acrosser. process, the Analysis Charge will be waived. to deal the whole repair services. inquiry for the delivery, ACR also can coordinate it and will charge for extra cost if any. them back to customers, if any.